Berrys Bay has long been a favoured subject for artists and photographers. Its sparkling waters, low key maritime activity and collection of ramshackle boat sheds merge to create a quiet charm that has endured over the years. From colonial painters to artists of the impressionist, modernist and abstract periods to contemporary artists and the hobbyists and art classes of today – all have been drawn to this special place. Photographers too, from the pioneers of the art prior to 1900 through to the enthusiasts that are to be seen today on foggy mornings find something special here. One of the first artists to capture the waters of the Bay was the colonial era painter Conrad Martens whose many paintings of Sydney Harbour include Darling Harbour from Berry’s Bay, painted around 1855. 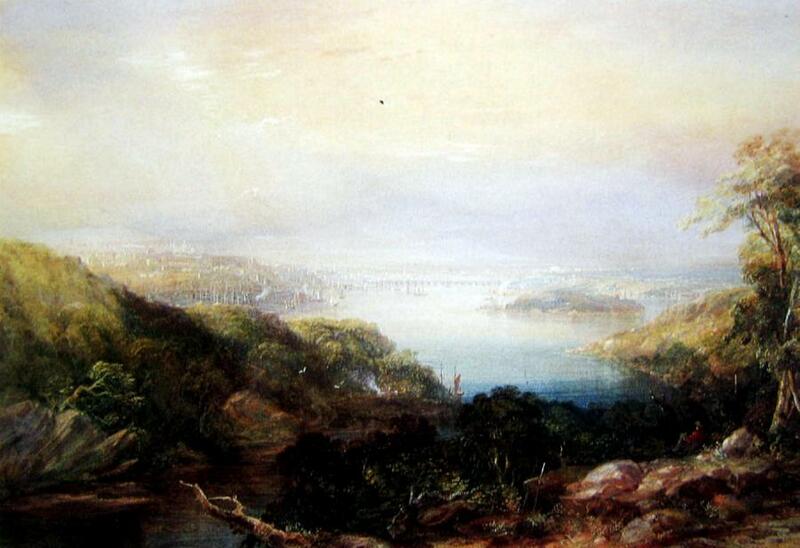 This painting shows an undeveloped bushland headland looking across Berrys Bay towards a distant, hazy city. It predates foreshore development in the Bay. In the early 1900′s the photographer Harold Cazneaux, widely respected as one of the founders of pictorial photography in Australia, had embarked on his impressive series of photographs of Sydney. Among these are a number taken in and around Berry’s Bay. By this time also artists had begun to take a real interest in “the working harbour”, Previously they had chosen to portray Sydney’s great waterway simply as a very beautiful place or had used it as a foreground to images that depicted the developing city. At Little Sirius Cove where Arthur Streeton, Tom Roberts and their friends lived a bohemian life many iconic works were painted and the place has long been recognised and preserved for its association with the artists of the time. It can be argued, however, that Berrys Bay is even more significant. 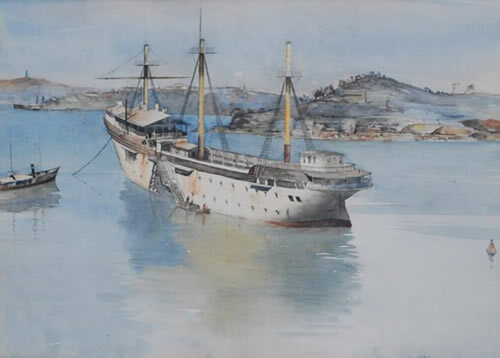 In the 20th century the attention of artists was drawn to the western bays of the harbour where nature and industry provided a captivating setting for their work. 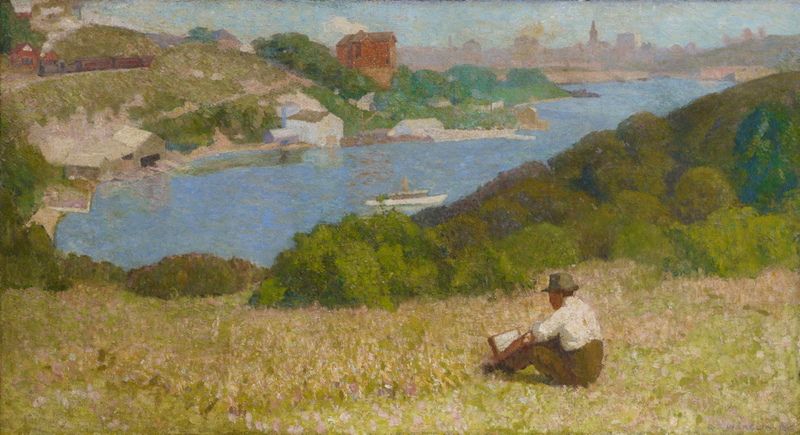 Berrys Bay was the perfect example of this and from 1910 through to the 1920′s and 1930′s a roll call of the painters known for their work around Sydney Harbour painted the Bay time and time again. Some lived nearby while others would have found the Bay Road station on the North Shore railway line, opened in 1893, a convenient way to reach the Bay. Frequently they would come together for a day’s painting “en plein air”. Painters of this period include Julian Ashton, William Ashton, Elioth Gruner, Lionel and Percy Lindsay, Sydney Long, Roland Wakelin and Roy de Maistre. Their images show an attractive grouping of sheds on the waterfront where Noakes boat shed now operates and views towards the city, the Harbour Bridge and Goat Island. There are small jetties rather than substantial wharves and, while large vessels appear in some of the older images, they generally provide a historic context and do not obstruct the views. In more recent times paintings show small boats on swing moorings, back dropped by the green bushland of Ball’s Head. Woodleys Boatshed, pleasingly located on the foreshore has also been a popular subject since its establishment in 1908. The view across the water towards the jumble of buildings has been one of the enduring images of the Bay. An extensive list of all the images we have been able to find is to be found at the link below, but some works deserve particular mention because of the special way they have captured the Bay and the place they hold in the history of art in Sydney and Australia. They also demonstrate the impact that a major development in the bay would have on this historic record. Roland Wakelin lived at several addresses in Waverton, particularly a house in Carr Street he called Cezanneafter the artist who so greatly influenced his art. He frequently painted the nearby Bay and its surrounds but his Down the Hills to Berry’s Bay, painted in 1916, is an iconic work. Painted from a location opposite Wood Street, this captures the tranquillity of the Bay with bright colour and a composition unorthodox for the time. This is widely regarded as the first “modernist” painting by an Australian artist. Finally, a contemporary local artist, Cameron Sparks, who until recently lived close by, frequently chose the Bay as a favourite subject. He has been in the unique position to paint the Bay before and after the removal of the oil tanks. Artists have painted the Bay and the adjacent Balls Head reserve continuously for a period that spans more than 160 years. All have shown the Bay to be a unique and charming place, harmoniously blending the natural environment with an appropriate level of maritime activity. In spite of the disastrous clearing of the headland in the 1930’s and the location of the oil terminal during the period 1920-94, the integrity of the Bay has been restored and maintained.We must ensure that the values that inspired past generations of painters and artists are not lost to those who follow them. We should also note that at the time of British settlement the Cammeraygal people were the custodians of the land and they were often depicted in the artists paintings. We can acknowledge their ownership and care of the land by restoring disturbed areas and allowing public access where possible. 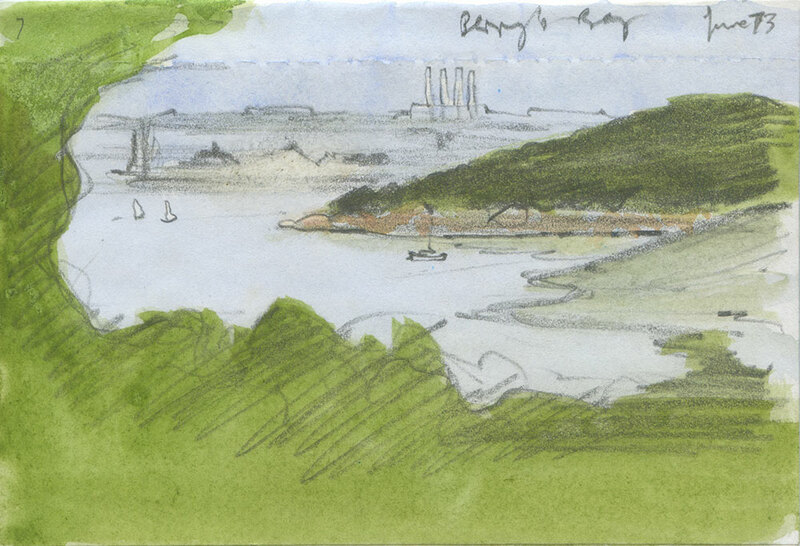 This artistic heritage review was researched and written by Ann Pugh who acknowledges the information given by the Wakelin, Rees and Sparks families, their permission to publish the images and their concern that mirrors her concern for the future of Berrys Bay. She also thanks Ian Hoskins, the historian at North Sydney Council, for his assistance.